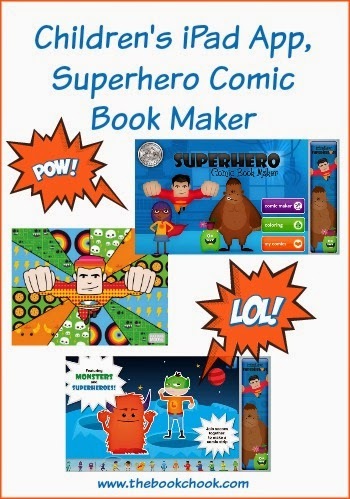 Superhero Comic Book Maker - by Duck Duck Moose grabbed my attention because I love to find ways for children to create. I especially enjoy discovering tools that help kids tell a digital story. I’ve previously reviewed the Duck Duck Moose app, Chatterpix Kids. The most important thing is that kids will love this app! Superheroes (both girls and boys) and monsters are represented with a variety of stickers, and the developers have caused them to make fun noises when tapped. The app worked well, and I loved the variety of templates, patterns and colours for decorating. The self-record feature is a useful idea to encourage kids to express themselves, and tell their own stories. The resulting little movie can be emailed from the camera roll as a .MOV file, and uploaded to Youtube or Vimeo etc. I found editing the stickers a bit fiddly at times. Kids will need to be patient if there’s some lag. I thought it was a shame from an educational point of view that letters were represented by a mixture of upper and lower case, making it impossible to create words “correctly”. However, that’s the teacher inside me commenting; I bet children never notice! When the developers are producing new versions, I hope it’s possible to introduce the keyboard somehow and perhaps speech bubbles so the app will become even more educational and versatile. Although of course children can save images, and add text with an image editor or another app. Digital storytelling is an excellent way to engage kids in expressing themselves. They will be thinking creatively and critically as they work out what story they want to tell, and how to record themselves doing it. I would recommend the Superhero Comic Book Maker by Duck Duck Moose to parents who want their kids playing creatively, and to teachers who want to capitalise on children’s fascination with heroes to involve them in learning. I’ll be adding this app to the Creating with Kids and iPad Apps list, and to my list of Tools to Involve Kids in Storytelling. Check out all my other iPad App Reviews on Pinterest.